From 17th-century scrolls to contemporary psychedelic prints, the MFA Boston points the route to Shambhala, Tibetan Buddhism’s mythic city. This article originally appeared in the May issue of Art & Antiques Magazine as “Urban Legend”. The Kunlun mountain range in Central Asia has a good claim to being the remotest spot on earth. Not as high as the Himalayas but harder to reach, they ring a windswept plain known as the Takla Makan Desert, where archaeologists recently found uncannily well-preserved mummies, over 2,000 years old, that bear no resemblance to the current inhabitants of the sparsely populated area. In a place like this, even today, when the whole globe seems picked over, one feels that something long-lost and strange could be hiding in plain sight. For Tibetan Buddhists, the Kunlun region is the site of Shambhala, an octagon-shaped sacred city—legendary or actual, depending on your point of view—ruled by a semi-divine king peacefully presiding over a population of learned, extra-long-lived subjects who possess both magical powers and high technology, which they use to preserve mystical knowledge until the end of the present world cycle. According to Tibetan lore, Shambhala (the name is Sanskrit for “source of bliss”), while existing in the physical world, north of Tibet, cannot be reached or even perceived by anyone who is not spiritually prepared. That stricture has never deterred explorers; the idea of an all-but-inaccessible, timeless citadel is simply too alluring. Over the centuries, Shambhala has not only drawn intrepid, if misguided, climbers to struggle through the ice and snow, it has also inspired imaginations both inside and outside Tibet. Tibetan Buddhist painters mapped it onto cosmic diagrams and portrayed the lineage of its rulers, while monks wrote detailed (if sometimes metaphoric) travel guides for seekers. 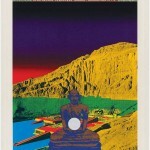 Nineteenth-century Western occultists reimagined Shambhala in proto-sci-fi terms as a shadowy underground realm called “Agarttha.” In the 20th century, Shambhala entered worldwide popular consciousness in the guise of “Shangri-La,” thanks to James Hilton’s 1933 novel Lost Horizon and the partially-lost (appropriately enough) 1937 film of the same title. And, as a highly unusual exhibition at the Museum of Fine Arts, Boston, demonstrates, the sacred city beckons contemporary artists, too. The MFA’s show presents work by two of those artists—Gonkar Gyatso from Tibet, and Tadanori Yokoo from Japan—alongside a set of medieval Tibetan paintings of the kings of Shambhala and various antique Tibetan objects that give three-dimensional reality to iconographic elements in the paintings. As curator Jacki Elgar tells the story, the exhibition came into being due to a happy confluence of events: In the 1980s, Elgar, whose main job is conservator of Asian artworks at the MFA, wrote condition reports on Yokoo’s print series “Shambhala” when it was acquired by the museum. Her interest was piqued. “I’m a conservator, so usually I don’t get to work with living artists,” she recalls. “Yokoo was a little bit like, Who are you? But we went to tea and just started talking about Shambhala.” Then, in the early ’90s, Elgar was going through the museum’s storage spaces and made a hiding-in-plain-sight discovery of her own—a group of 23 Tibetan paintings from the 17th century, in distemper on cotton, that had been donated in 1906 and lain neglected ever since. She began work conserving them and remounting them in the way they were intended to be seen. Finally, in 2009, Gyatso’s Shambala in Modern Times was featured in the 53rd Venice Biennale, bringing about what Elgar calls an “a-ha moment,” and work on the current exhibition got underway. The scroll paintings, which Elgar describes as the “backbone and impetus for the show,” were bought in Paris by an American collector, Denman Waldo Ross, from a woman who apparently got them from China. They were mounted in Japanese wooden panels, a setup that was false to the original intent of the artists. 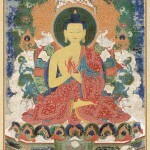 They intended the pictures to be displayed as hanging scrolls, known in Tibetan as thangkas. In the MFA’s workshop—which Elgar proudly points out is “the oldest Asian conservation studio outside Asia”—the paintings were removed from their mounts and “in taking them apart, we found clues as to which was which, and now we have them in the right order.” Using infrared reflectography, the MFA team identified preliminary sketches and shorthand notes on the paintings from the master painter to his apprentices. The total number of Shambhala kings is 33 (including the original Buddha, who is counted as one), of which the MFA’s series has 23. According to Tibetan teaching, the present king of Shambhala, wherever he may be, is called Aniruddha; his reign began in 1927 and will end in 2027. In the MFA’s painting, he is shown on a throne holding an iron elephant goad and a noose. A ferocious, red-eyed lion glares at him, perhaps symbolizing the challenges facing such an administrator during a time when the Kalachakra (or “wheel of time,” the sacred teaching safeguarded in Shambhala) is largely ignored or forgotten by the outside world. After Aniruddha, there will be five more kings, the last of whom, Rudra Chakrin, will emerge from Shambhala and engage the enemies of Buddhism on the field of battle. Accordingly, he is depicted in fighting form rather than seated, with a shield and a spear and surrounded by chariots. After the war—which some Tibetan sources predict will occur in the year 2424—a golden age will ensue in which the Kalachakra knowledge will spread virtue throughout the world. The graphic works of Yokoo and Gyatso are very different from these traditional representations, and also from each other. Yokoo, born in Japan in 1936, started out as a graphic designer and did bold commercial work influenced by Milton Glaser and Seymour Chwast of Push Pin Studios. He got heavily involved in yoga and meditation in the 1970s and says he had a dream visitation from the king of Shambhala. He takes the myth seriously, but his “Shambhala” series is playful and psychedelic, dealing in a set of symbols devised by the artist rather than reworking or adapting traditional Tibetan iconography. 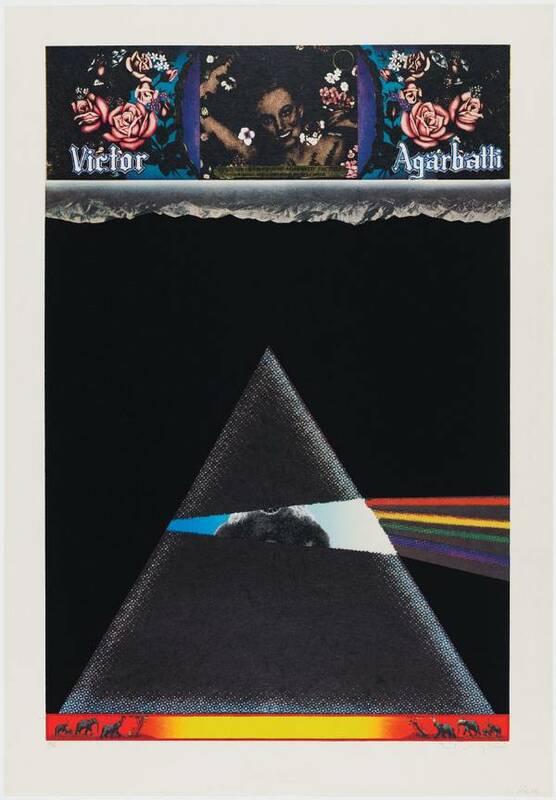 Yokoo’s Prithvi Devaloka (Earth-Heaven), with its rainbow-emitting pyramid against a black background, closely resembles the cover of Pink Floyd’s Dark Side of the Moon; Elgar notes that Yokoo actually got there first, having used this image for a book cover design in Japan in 1972, a year before the album came out. 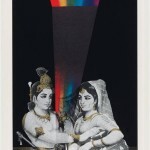 Other works by Yokoo in the exhibition mix Hindu and even ancient Egyptian images with Buddhist themes and advertisements from India, against backgrounds of electric, hallucinatory colors that suggest a dream state or other forms of visionary consciousness. According to Elgar, Yokoo at first believed he had to seek Shambhala through yoga practice but no longer feels the need to do so, since Shambhala is now “an integral part of his being.” In that sense, he may be very close to the intent of the Kalachakra, which stresses the importance of finding enlightenment through everyday things and eternity in the fleeting moment. Gyatso, born in 1961, is a member of the generation of Tibetans that grew up under Chinese rule. 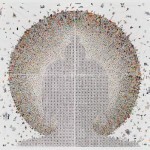 His work has a lot to do with Tibetan identity and with making the idea of Shmabhala relevant to the contemporary world. In the MFA show are a pair of photographs depicting the artist in two guises: as a traditional thangka painter (modeled on a famous 1937 photograph taken in Lhasa of the then-Dalai Lama’s chief painter) and as a Communist hack artist doing a portrait of Chairman Mao. 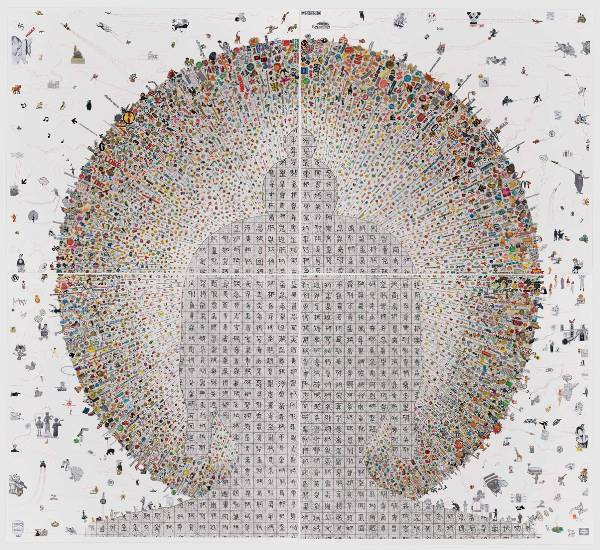 In his Shambhala in Modern Times (2009), a silkscreen with gold and silver leaf on paper that was at the Venice Biennale, an outline of a traditional Buddha head radiates a burst of tiny colorful objects outward, spraying to the edges of the frame. On closer inspection, the tiny objects are seen to be images, logos and bits of text from global popular culture and commerce. The Buddha’s head contains a grid filled in with glyphs, invented by the artist, that merge Tibetan letters with Chinese characters. “Shambhala for me is urban life,” Gyatso has written, “the way that the city acts as a sponge, mixing everything up and then releasing that energy out into the world.” For Yokoo, Shambhala is in your head. For Gyatso, it’s the global metropolis. For Elgar, it’s a myth that “gives you a hope that there are people in the world who are holders of civility and sanity, that whatever happens, it will get better.” We may have to wait till 2424 to know for certain.